Then at 6:50 this morning, DJ once again said he needed his bathroom so he could sit on the stool....so off he went...I didn't get up immediately to be with him as I heard the garage door open...kinda scary when I heard Howie leave an hour ago...so I called him...nothing....got up and ran to DJ's room...the truck was there! Whew! I called him again as I was walking into the kids bathroom....he answered! It was then that DJ says to me "Am I your hero Mum? I did it all by myself" and I realize he'd actually thrown up...IN the toilet!!! So, yes, he IS my hero!!!! After upchucking the last of the 10 Ritz crackers he ate for dinner, he must have been feeling good as he wanted to watch Polar Express...and with Daddy home...I went back to bed! Unfortunately it was short lived as DJ was in bed with me again around 8! He was cold and wanted to snuggle...and apparently that was it too, once he got warmed up he bolted! Next thing I knew...it was 10:23!!! Gadzooks!!! I can't remember a time since getting pregnant with DJ that I have slept til past 10 am!!!! Let alone past 9 am!! I got up slowly and savoured the quiet!! But at the same time wondering how DJ's doing...if he's eaten anything...had anything to drink....if Sam's eaten...and so on! The mother brain kicks in! And of course, all is under control! DJ had had a piece of toast and so far, so good! The only struggle we had was getting fluids in him...normally he's chugging on a sippy cup all day...but since the fever hit, its been a huge struggle to get anything in him! He started getting really hungry around lunch...and begging for milk, which we denied...at least til tomorrow...and lunch was light...crackers, cheese, and applesauce. He kept it down and was actually starting to drink some fluids. He was also bouncing around the house like Tigger!! Begging to go outside and play with his "neighvors" or have them come over to play....but we said "not today! "...such a hard thing for him to hear! The snacking started after lunch....he ate a snickerdoodle....then some cinnamon goldfish...and then some plain popcorn....pretty much non-stop come to think of it! Jake had a doctor appt this aft, so Howie took him while Sam was snoozing....DJ and I did the popcorn garland and I took a shower...the all kinds of crazy happened....Sam woke up, DJ went in and robbed her bed of all stuffed animals...I got her out, Howie and Jake came home...I got dressed and left to run a couple kid free errands...like getting pizza for dinner and a movie for later...I get home and I see Samantha at the tree...eating it!!!!! 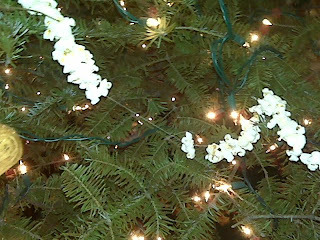 Not the tree...but the popcorn off the garland! Here's the evidence!!! We had a good laugh!!! She's only gonna be 1 once....so she's enjoying it to the fullest!!! 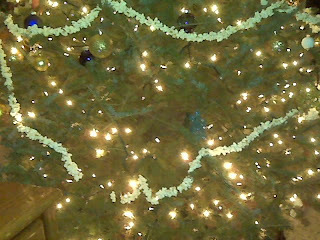 Tonite once the kids were in bed...which was somewhat smooth...Sam put up a bit of a fight and so did DJ which is odd since he was visibly exhausted! Once they settled we didn't hear another peep from them! The movie tonite was The Taking Of Pelham 123 with Denzel Washington and John Travolta...what an intense movie!!!! It took me a bit to get into it, but once the characters were developed....man it was gripping!!! I highly recommend it!! !